Defensive Driving Class…..If you get a ticket in the City of Oklahoma City or the City of Mustang, this class may qualify you for a reduced fine or dismissal of the ticket. Don’t forget to bring your ticket or ticket number with you. Check with the appropriate Municipal Court for more details. Brown’s Driving School is able to administer the driving test to anyone that has a valid permit. If over 18 must have it for over thirty days, if under 18 must have it six months or until reaching the age of 18. Students who pass the driving test may go directly to the Tag Agency to get the new license. This minimizes waiting in long lines at DPS and facilitates the process of acquiring a driver license. See the Driver Education page. Also, when taking one of the motorcycle courses and after receiving a completion certificate from Brown’s, the motorcycle written and road exam at the Department of Public Safety will be waived. Our #1 suggestion is to drive at home with family daily. Driving long distances is great for young drivers. When new drivers are not driving, but a passenger, do not let them use cell phones. Students today are very directionally challenged. They do not know their directions and how to get to their destinations. We believe this is a direct result of phone usage while parents are driving. This is critical in the development of all new drivers. With this law in effect Brown’s Driving School is a great option to correctly complete the motorcycle endorsement licensing process. Anyone 17 years of age or younger MUST complete a certified Motorcycle Safety Foundation course before adding the “M” endorsement. Anyone age 17 or younger no longer has the option to take the written and riding test with a DPS examiner. Don’t delay. Brown’s Driving School will take care of your motorcycle training requirements. Are Your Car Mirrors Adjusted Correctly? The new traffic signal means that an unprotected left turn is permitted only after a motorist yields to oncoming traffic and looks for pedestrians. It is intended to be an additional safety prompt urging caution for motorists preparing to make a left turn. Essentially, it means the same as a solid green light where left turns are permitted. National studies have shown the flashing yellow arrows promote safety, reducing broadside collisions at busy intersections by 40 or 50 percent. 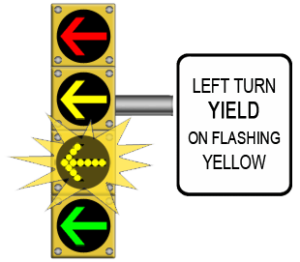 Flashing yellow arrows are used in major cities across the United States, but Norman is the first city in Oklahoma to incorporate their use. Oklahoma State Law says to signal at 100 ft. or 1/3rd block before the turn. It’s difficult to know how far 100 ft. is standing still, much less in a moving car. Brown’s promotes signaling before you brake or 2 to 3 seconds in advance of the turn.